When driving on an unlaned road, where should your vehicle be positioned? When driving on an unlaned road, where should your vehicle be positioned? What is an unlaned road? An unlaned road is a road where there is no centre line marking the lanes. It might be that the road is too narrow to form two lanes of sufficient width, the road is metal/gravel, or it's a secondary rural road with light traffic. When driving on an unlaned road, stay left. Take extra care around blind corners as vehicles could be partially over your side of the road. 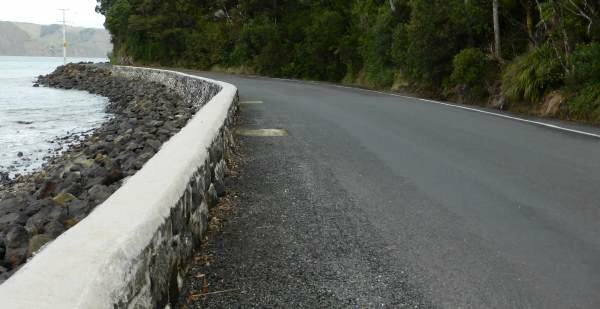 This photo shows an example of an unlaned road that is on the way to Whatipu, west of Auckland. The road is reasonably wide, but the traffic levels are low. A white line is marked down one edge of the road whereas the wall serves to delineate the other side of the road. Care should be taken on unlaned roads with a gravel shoulder as these will be slippery. They can also have sharp objects in them which could puncture your tyre. On gravel roads, the edge of the road will often have much thicker gravel or shingle which will have less grip. Intersections on gravel roads will not have lines to mark them.